ADT's latest marketing effort sought to educate Santiago, Chile apartment owners about the dangers of home invasion by scaring the piss out of them when they got home. The ploy, while no doubt startling to those who discovered it, was actually pretty ingenious. 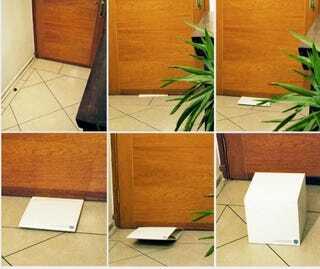 Using a spring loaded box, ADT marketing professionals (Née burglars working for ad agency DDB) would slip the flat box under the doors of apartment and condo owners throughout Santiago. Once clear of the door, the box would spring into shape, making it appear as though the world's most generous burglar had been inside.